Published May 7, 2015 by Cisco Press. Part of the LiveLessons series. 7 hours of video training on Cisco ASA 5500-X Series Next-Generation Firewalls, from initial design to advanced configuration and troubleshooting. 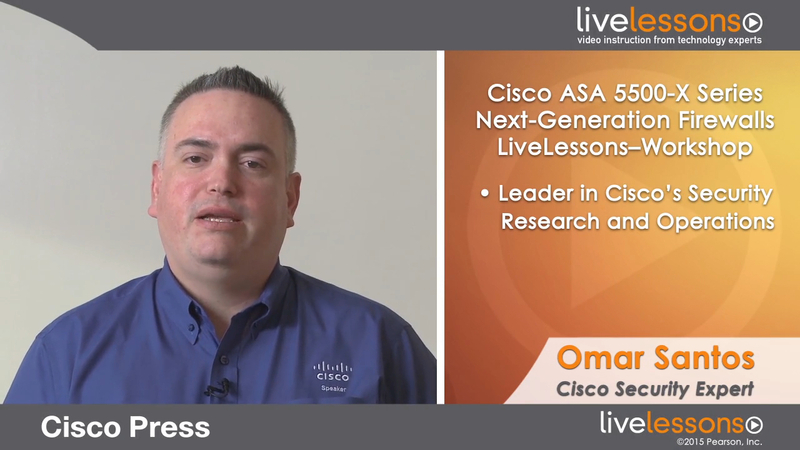 Cisco ASA 5500-X Series Next-Generation Firewalls LiveLessons (Workshop) is an engaging and unique video course taught in front of a live audience. Omar Santos, senior incident manager and the technical leader of the Cisco Product Security Incident Response Team (PSIRT) and author of Cisco ASA: All-in-one Next-Generation Firewall, IPS, and VPN Services, teaches you the skills you need to design, configure, and troubleshoot the firewall features of the Cisco ASA 5500-X Series Next-Generation Firewalls and FirePOWER services with Advanced Malware Protection (AMP). This live video introduces Cisco ASA solutions to overcoming obstacles by providing complete configuration and troubleshooting guidance. Cisco ASA 5500-X Series Next-Generation Firewalls LiveLessons (Workshop) is the definitive insider's guide to planning, installing, configuring, and maintaining the new Cisco ASA firewall features. Omar Santos is a senior incident manager and the technical leader of the Cisco Product Security Incident Response Team (PSIRT), where he mentors and leads engineers and incident managers during the investigation and resolution of security vulnerabilities in all Cisco products. Omar has more than 19 years of experience (15 at Cisco) working with information technology and cybersecurity. Omar has designed, implemented, and supported numerous secure networks for Fortune 500 companies and the U.S. government. Prior to his current role, he was a technical leader within the World Wide Security Practice and the Cisco Technical Assistance Center (TAC), where he taught, led, and mentored many engineers within both organizations. Omar is an active member of the security community, where he leads several industry-wide initiatives and standard bodies. His active role helps businesses, academic institutions, state and local law enforcement agencies, and other participants that are dedicated to increasing the security of critical infrastructure. Omar is the author of four books, numerous whitepapers, articles, and security configuration guidelines and best practices. Omar has also delivered numerous technical presentations at conferences and to Cisco customers and partners, as well as many C-level executive presentations to many organizations. Beginning to Intermediate: This video title encompasses topics from an introductory level to advanced topics on security and next-generation firewall capabilities. The skills you need to design, configure, and troubleshoot the firewall features of the Cisco ASA 5500-X Series Next-Generation Firewalls. Security professions; network professionals who manage network security and install and configure Cisco ASA firewalls. This lesson provides an overview of the Cisco ASA product family, including ASA model comparisons, an introduction to feature licenses, and how shared licensing servers can be provisioned. In this lesson, you learn how to access the Cisco ASA console, the Cisco ASA Services Module (ASA-SM) console, and the virtual ASA (ASAv) console and how to configure ASDM access for the ASA, ASA-SM, and ASAv. This lesson introduces the routed and transparent firewall modes. It explains how data moves through the ASA in both firewall modes. It provides step-by-step demonstrations on how to configure the firewall mode, along with several guidelines and limitations on each firewall mode. In this lesson, you learn what security contexts are, how they are used, and how the Cisco ASA classifies packets when security contexts are configured in the device. You learn the licensing requirements for multiple context mode, along with step-by-step demonstrations on how to configure and manage multiple security contexts in the Cisco ASA. This lesson convers how to configure basic setting in the Cisco ASA, such as how to set the hostname, domain name, and passwords. Additionally, you learn how to perform password recovery, how to set the date and time, and how to configure the Cisco ASA with a Network Time Protocol (NTP) server. This lesson also covers how to configure DHCP services in the Cisco ASA. This lesson introduces what NAT is and the difference between static NAT, dynamic NAT, dynamic PAT, identity NAT, and twice NAT. You learn how to configure and troubleshoot all these different NAT implementations. In this lesson, you learn how to control network access and what access control lists (ACL) are. You learn how to configure and manage all ACL types, including standard, extended, webtype, ethertype, and time-based ACLs. In this lesson, you learn how routing behaves within the Cisco ASA, what the egress interface selection process is, and what routing protocols are supported. You learn how dynamic routing behaves in failover configurations, ASA clusters, and multiple-context mode. You also learn how to configure, monitor, and troubleshoot static routes, OSPFv2, OSPFv3, EIGRP, BGP, and RIP. In this lesson, you learn what authentication, authorization, accounting (AAA) is and what the supported authentication methods in the Cisco ASA are. Step-by-step guidance on how to configure local authentication and external authentication servers, such as RADIUS and LDAP servers, is provided. You also learn how to configure AAA for management access and firewall connections. This lesson introduces the virtual Cisco ASA (Cisco ASAv). You learn how to deploy, monitor, and troubleshoot the Cisco ASAv. This lesson starts by introducing the high availability capabilities of the Cisco ASA. The lesson provides an overview of failover and design details and what the system requirements are. You learn how to configure and troubleshoot active/standby and active/active failover. This lesson also covers how to configure, monitor, and troubleshoot ASA clusters, the different data interface modes, and the packet flow within a cluster. In this lesson, you learn what application layer protocol inspection is and how the inspection engines work. You also learn the modular policy framework and how to configure application inspection for numerous supported protocols. This lesson provides an introduction to logging, how logging works in multiple-context mode, and how to perform syslog message analysis. You learn how to configure the different logging modes and several best practices on how to monitor syslogs. This lesson provides an introduction to NetFlow and how to configure NetFlow secure event logging (NSEL). You also learn several tips when troubleshooting NetFlow implementations. In this lesson, you learn the capabilities of the Cisco ASA with FirePOWER Services. You learn the difference between inline versus passive mode. This lesson provides step-by-step guidance on how to install, re-image, and configure the FirePOWER module. You also learn how to add the Cisco ASA FirePOWER module to the FireSIGHT Management Center. This lesson covers the Cisco ASA threat detection feature. You learn how to configure and monitor basic, scanning, and advanced threat detection in the Cisco ASA. This module includes the questions and answers covered during the course.